There it is, my front door. I obviously wasn't thinking ahead when I decided to crop all these pictures into squares. I knew in advance I had to photograph my door, and I also knew how stubbornly rectangular my door is. So really, you end up with just The Corner Of My Front Door, which isn't quite as catchy as far as prompts go. So, the door. It's getting old, and needs a new coat of paint (or any coat of paint, really). Sort of blah. It's been kicked a lot, and as a result is pretty scuffed up. 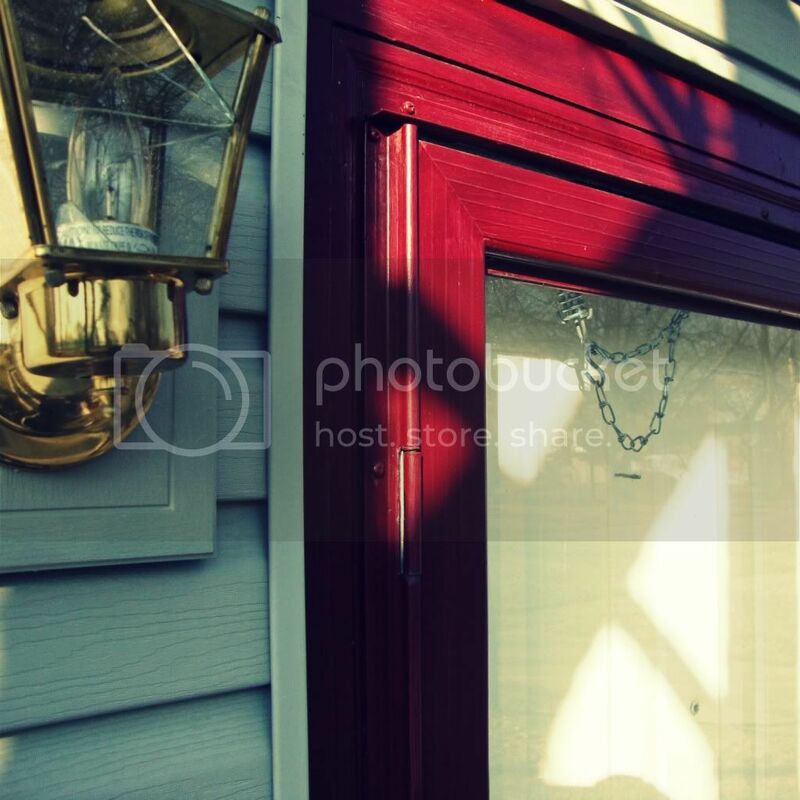 Check out that porch light - can we say "dated?" The 80's called and they'd like their brass fixture back, not to mention that it's broken, courtesy of the storm door catching wind like the tattered mainsail of a pirate ship and subsequently smashing against the siding at top velocity (or getting "smacked upside the house," if you will). Hmmm. Getting old? Scuffed up? Out of date? I don't think I like how much I have in common with my front door these days. Throw in "needs a nap" and we're practically twins. Which makes me wonder: can you tell a lot about a person just by looking at their front door? They say (whoever "they" are - a bunch of morons with too much time on their hands, is my guess) that the Eyes are the Windows of the Soul. If they are, then Snooki has way too much mascara on her windows, in my opinion. Or would that be on her soul? I don't know, it's a confusing metaphor. But maybe that's because you should really be judging learning about people by studying their front doors instead of their eyeballs. Or maybe I'm just full of it. One thing my door and I don't have in common is this: my front door doesn't have several children hanging off of it every day, asking what it's making for dinner, tipping over its baskets of freshly folded laundry, and bringing it glitter-dipped Valentines, the sparkly coating threatening to infest the entire house like a plague of transvestite dust particles. In that respect, front door, we're nothing alike at all. Score one for me. Doors are the new windows anyway. Windows are soooooo last week. I love this post, but the only thing you and that door have in common is that you're both mine. MINE!! accidentalblog, thanks! I love it when I can inspire introspection and a deeper understanding of oneself. :) hahahaha I'm kidding, I never do that.